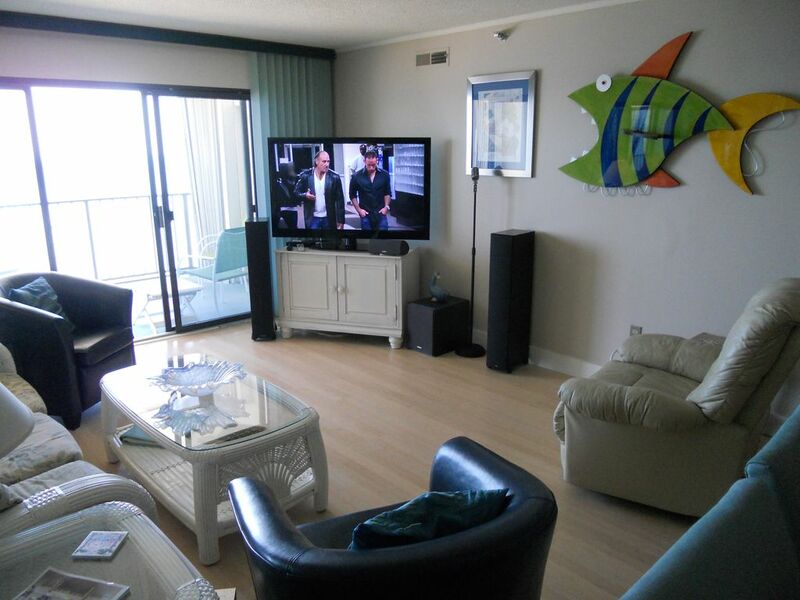 Ocean Front 3 B/R Condo in Oc, Md. Newly Renovated, Pristine. Beautiful Ocean Front 3 b/r condominium recently renovated with a gourmet kitchen, tiled bathrooms, large screen HD/TV in master b/r and l/r with surround sound. Flat screen TV's in two remaining bedrooms and kitchen. All new mattresses and box springs. Linens provided for additional fee. This unit is without a doubt the premier unit in the Plaza. Located on the top floor, the views are breathtaking. Sunrise view from east balcony and sunset view from west 'lighthouse' bedroom. The complex has a large ocean front deck with pool and outside bar and grill. Live music in season. In-house bar and restaurant. On-sight parking. Large selection of local restaurants and recreation. Water sports. High speed elevator. Indoor pool with hot tub and sauna. WiFi available. Master bedroom has a king size bed and a vanity and sink area separate from the bathroom. West bedroom (lighthouse room) has a queen size bed and a view of the bay. Middle bedroom has recently gotten a face lift and has a pyramid bunk bed with a twin on top and a full on the bottom and 'endless summer' motif. All new bed, tv and sitting area. The kids love it! Queen size sleep sofa in living room. Washer and dryer, central air. You will not want to leave once you experience this unit. Keywords: Ocean Front condo, condo ocean front, highrise ocean front condo, three bedroom ocean front, ocean front condo sleeps up to nine. We have been spending summers in Ocean City for over thirty years. We love coming here both in and off season. We thoroughly enjoy water sports and dining in the fine restaurants around Ocean City. Our children have spent summers here their entire lives and we love having them visit us. They always bring our grand dogs, labs Tucker and Marley who just love to play in the water. This condo was stellar! With all of the amenities available to us, and the quality of the furniture, beds and kitchen, we were really able to relax and feel very comfortable. It was also very clean! The view of the ocean was breathtaking and I miss it so much! The staff at the Plaza were very hardworking and on top of everything. One of the best features of the condo is the owner. She was absolutely wonderful to us. We will always treasure our time at Ocean City and in this unit. We all loved the kite in the closet too! Highly recommend this place! Thank you so much, Denise for writing such a great review. I'm so pleased that you had such a great time coming all the way from Colorado. I sure hope you make it out this way again. I will have to look for the "kite in the closet." I don't remember seeing that. Our family stayed at this condo for 7 nights and had a great experience. Very spacious and clean, beautiful views of the ocean and bay. Perfect for just relaxing on the balcony enjoying the ocean. It is really a perfect condo for any family. The location is great, very quiet. The owner Jeannie was absolutely wonderful, answering all of my questions quickly and checking in to make sure everything was going okay. I would definitely stay at this condo again. Thank you Diane. I'm so glad I was able to accommodate you. I look forward to having you again and, hopefully, I will get to meet you the next time. My family has rented this beautiful condo for a few years now and it is the most beautiful condo on the beach. I have written a review in the past but I felt compelled to write another. I, unfortunately, waited too long to contact the owner this year and the dates that we wanted were already taken. I am absolutely broken-hearted over this. We drove the 3 1/2 hours yesterday to see if we could find something else. There is nothing I would even consider. There is nothing that can compare to this beautiful condo. The owner is one of the kindest, helpful people you will ever have the pleasure of dealing with. I have definitely disappointed my family this year so I would suggest that you don't delay in renting this beautiful place; you will be in awe of what you see. Thank you so much, Lynne, for your wonderful comments. I'm so sorry things didn't work out for you this year. We will have next year. Our family stayed at this condo for 7 nights and had a wonderful experience. Very spacious and clean. Great views of both the ocean for the sunrise and the bay for the sunset. We have two young boys and we were able to get them on and off the beach very quickly for lunch and naps. It is really a perfect condo for any family. The location is great, very quiet and can easily walk to restaurants and shopping. The owner Jeannie was so very nice, responding to all of my questions quickly. I will definitely stay at this condo again. Thank you Pam, for such a nice review. I'm so glad you and your family had a wonderful vacation. You are definitely among my all time favorite guests! Looking forward to seeing you again next year. Jennie. Our family stayed in this beautiful top floor condo for five days in June. We chose this unit because of the pictures here and great reviews, and were even more pleased when we arrived. It is very comfortable, has a lovely modern kitchen and great bedrooms. The view from the patio overlooking the beach is amazing. We enjoyed being far enough away from the bustle of the boardwalk to explore all of Ocean City, but also found it easy to get to the boardwalk when we wanted to go. The best part for us was that he the owners were easy to make arrangements with and communicated so well. You can confidently book this condo for a wonderful stay! I am so pleased you enjoyed your stay. Particularly because you came all the way from Texas. We would love to have you come back. Thank you for your nice comments. We were fortunate enough to spend four wonderful nights in this beautiful condo at the beginning of October! The unit is even more gorgeous than the photos! We loved everything about it, but especially the wonderful view from the balcony as well as all the attention to detail in all aspects of the unit. The owners were great in all communications with us and were very helpful with info on local sites and restaurant recommendations! The building was very secure and the unit spotlessly clean! The high speed elevator zips you right up to the top floor! I would definitely recommend this condo to you as well as a visit to Ocean City, in general. It was our first trip there, and we were truly surprised at how much we enjoyed it. I am sure being there in the off season, we saw a very quiet side to this very busy summer destination. We thought staying a bit further out away from the boardwalk area was a perfect choice! Overall, a great experience! Janis, thank you so much for your nice comments. You were so fortunate to have such lovely weather and to be able to spend time with your daughter. I hope the wedding was a great success and I hope you will come back and stay with us again.